The new chain of halal German kebab outlets have been popular abroad and have begin to spread across uk. The certification is a little confusing. I have contacted them. The beef is not stunned and is islamically slaughtered however it was unclear about the chicken. 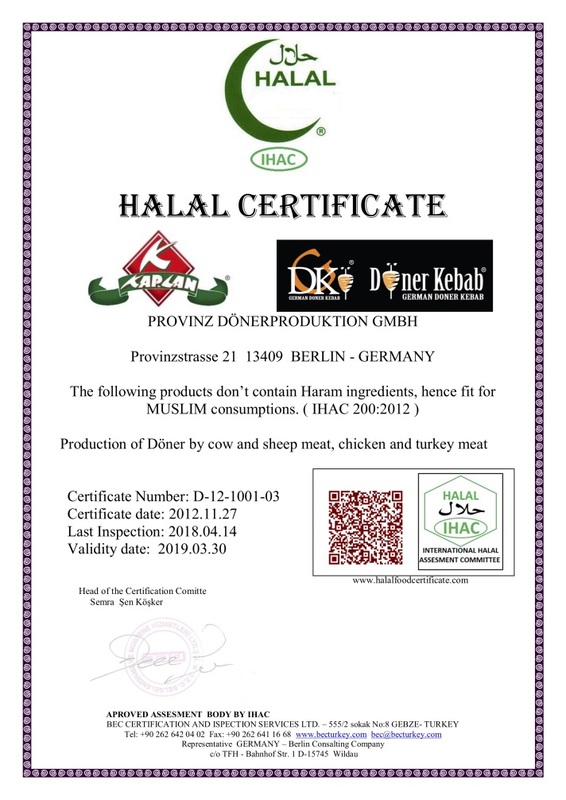 The meat is certified by HQC a German halal certification body. Currently the only differences between HMC and HFA is that HFA allow stun-to-stun method whereas HMC don't. And HMC know for sure they're certified restaurants are still free of contamination. Wifaqul Ulama have addressed the issue with HFA's method of stunning and to me seems to be okay. HOWEVER, unlike HMC, HFA can't prove that their meat and poultry is being "sold" is halal at the point of last sale. See KFC thread for details. Edit: HFA yet to respond about the number of personnel during the entire process. At German Doner Kebab we serve lean halal meat (chicken and beef), imported from Germany, across all our branches in the UK. We also use the same meat supplier for our stores in the UAE, Qatar, Oman, Egypt, Sweden and Bahrain to ensure consistency throughout the German Doner Kebab international brand. Another article about doner, but not specific to the topic, just an interesting read. They have age-old Franconian names, eat sausage rolls for breakfast and worship on Sundays. But the Bärlein-Denterlein family of Nuremberg are butchers who follow strict Islamic codes. They've long been one of the biggest producers of döner kebab meat in northern Bavaria. By the city hall subway station in Fürth, three old men stand in front of a small fast-food stand, drinking tea and chatting in Turkish. Behind the sticker-plastered window a young man sharpens two giant knives in front of colossal cones of meat slowly rotating on spits, the makings of that king of fast food in Germany: the döner kebab. It's a scene that can be witnessed at thousands of similar mini-restaurants across Germany, particularly in Berlin or in the Ruhr Valley. But this one is slightly different. One of the stickers on the window reads: "Quality meat from Bärlein-Denterlein." An age-old Franconian name on a traditional Turkish Imbiss (snack bar)? The incongruity is like finding a Chinese restaurant called "Acropolis." The name remains a mystery even after a few inquiries. The slaughterhouse is a "Muslim business under Christian operation," it is said. Further investigation leads one to the industrial area of Neustadt, a town 45 minutes northwest of Nuremberg in northern Bavaria. Above an entrance is the firm's insignia: an ornamented ox head. It looks like a logo for any other Teutonic slaughterhouse. But the family business has long earned a large portion of its revenue from Turkish and Kurdish immigrants. Ninety-five percent of the slaughterhouse's business goes to döner kebab stands and Turkish supermarkets in the area. And the market is continuing to expand. There are more than 15,000 döner stands in Germany, and the kebab has long been one of the country's favorite fast foods. Between 200 and 300 tons of döner meat are produced per day in the county. Many pre-formed cones of meat involve ingredients as questionable as those in an industrial meatball. But döner is different in middle Franconia, says Alexander Bärlein-Denterlein, the son of the owner. Most Imbiss restaurants layer and season their own meat. "Because of that, a true competition has emerged, and every stand claims that they make the best kebab in the city," he says. So the slaughterhouse delivers only the raw material, which is in high demand in greater Nuremberg, as well as in Neustadt. Inside the slaughterhouse, there are few clues to that which had just taken place. The walls, which were splattered with blood just hours before, are clinically white. Shimmering steel hooks hang about that had just pulled along lambs, calves and young bulls before they were sliced up. In endless red plastic baskets lie pancakes of ground beef and turkey. A steel machine has recently flattened some poultry thighs. Musa, who works with Ömer and Osman as butchers in the slaughterhouse, has long finished his day's work. Before he kills an animal, he says a short prayer -- a single one for each animal. Mostly it's the same sentence: "Bismillahi Allahu Akbar" (In the name of Allah, Allah is great). "Just as Muslim ritual prescribes," says Bärlein-Denterlein. "Many think that the Koran only requires that animals be butchered in a certain way," he says. "But what's important is the prayer toward Mecca. A lot of Muslims don't know that." Bärlein-Denterlein knows the direction of Mecca from Neustadt. Recently, during Eid al-Adha -- a Muslim holiday commemorating Abraham's willingness to sacrifice his son -- a few customers rolled out their prayer mats in the neighboring garden. Since then, he knows that when you look directly out the slaughterhouse's front door, you look toward Mecca. Aside from the ritual prayers, the business works for Islamic correctness in other ways. If calves, lambs and cows take their last steps at the Bärlein-Denterlein shop, chicken parts arrive pre-butchered every day at 3 a.m. And the most popular slaughtered meat in Germany -- pork -- is taboo for Muslims, so the business that courts them keeps its distance, too. Privately, of course, Bärlein-Denterlein lives like most Germans in Franconia. "In our home, everyone eats bratwurst in a roll or sausage for breakfast. Our Muslim employees accept that as well." What they wouldn't accept is for halal meat to come in contact with pork. "That's why we don't slaughter pigs," he says. "One can't entirely rule out that a knife trimming a döner would still have traces of pig's blood." Despite such diligence, the Bärlein-Denterleins often straddle two cultures. One day a number of Turkish Muslims appeared in front of the door wanting proof that no pigs were slaughtered on the site. A little later they left satisfied. But there were also German animal-rights activists who harassed the business over cruelty to animals. "Once they were convinced that the animals were anesthetized before the slaughter, they quickly laid down their guns," says Bärlein-Denterlein. Alexander now calls it a day around noon -- with 10 hours of work behind him. His mother-in-law Christel still has a few hours to go. Orders for the coming day need to be prepared. Christel has turned it into a science: "A snack bar near a school is busiest around midday, one near a disco around three in the morning," she says. "And garlic sauce is not a big seller where businesspeople eat lunch." On Sundays, the family goes to church. Faith is taken seriously here. Once, a customer joked with Bärlein-Denterlein's father-in-law by asking if he wanted to convert to Islam. "That's the one thing I won't do," he responded. As per the certificate, see link for further details. IHAC International Halal Assessment Committee. Unable to find procedure/method of Halal. However, IHAC have this on a webpage. (Email address available for further information for those who wish to find out on a personal level - Otherwise email sent and awaiting response). -We should apply KAFALAT SYSTEM at Halal certification. In all conditons we would rather act according to kafalat system in Fiqh. a- Halal certification should respect mazhab opinions. Hanefi, Shafi, Hanbali, and Maliki are major mazhabs and they are a blessing to us, not a reason for division. b- For certification of international companies, we must push them to accept and follow Halal requirements in all of their production plants worldwide, not in one particular place. Because, otherwise, Muslims may be deceived by greedy companies. c- All respected international certifiers should become members of one reliable umbrella organization. d- Umbrella Organization members should accept and follow one single unified standard. e- Umbrella Organization should be responsible on accreditation and supervision of its members. f- Umbrella Organization should have a budget and a controlling and monitoring authority. g- Umbrella Organization IHAC should be governed by the executives that are duly elected. h- Umbrella organization should work above country or government politics. i- Umbrella organization should be internationally recognized and be legally established. k- Maslahat of Muslims must be considered in Halal certification. l- Members should recognize and accredite each other under adequate supervision. n- Fiqh and technical boards should be appropriately established. o- Council should establish training center, research center and laboratory. p- Council should train and appoint independent Halal auditors and trainers for promoting Halal awareness in the public and in trade. r- Council may establish international market chain for distribution of halal certified products. s- IHAC web site must be active at once. If we want to reach this wisdom of ayah, firstly, we must believe our duty is so important. Sahih Bukhari, Volume 003, Book 034, Hadith Number 438. GermanDoner is trade mark of Provinz/Kaplan Company and it is our certified company by our aproved certification body BEC. (aproval for TURKEY, GERMANY, ITALY, BOSNIA AND HERSEGOVINA, BULGARIA ) BEC aproved by IHAC and acredited by TURKAK. I hope this answer will be enough. Awaiting 2nd E-mail as 1st email was not fully answered - although it does indicate they do not use mechanical slaughter. So the possibility of stunning is there (which can still be fine), question is, "To what extent"
If it is Stun - to - Stun and the chicken lives and then is slaughtered, then I guess it would be the same as those of Freemans Poultry. Allahu Alum. Wifaqul Ulama have never endrosed HFA in anyway. What we said is that Nandos chicken is stunned by a plant which has been checked by Mufti Yusuf Sacha (DB). Please point out the post where you have come away with the impression that Wifaq has endorsed HFA so it can be corrected. The reason I said what I said the way I said it was not because of what is written about KFC in the linked post, rather about the halal process and methods of HFA vs HMC as per the sisters question of HFA vs HMC and not based on KFC vs Nando's. Wifaqul Ulama's findings on HFA (not KFC) seem to tick all the boxes for the Dhabiha process up until the slaughtering of an animal (to my understanding) but refrain from endorsing KFC (or HFA) because HFA could not provide answers during the entire process from the complete monitoring process to the number of personnel, to the farm to the point of sale and to the plate. Hence my comment starting in capital letters as a disclaimer - "HOWEVER..."
Please double check this information and confirm my understanding as discussed on the phone. 1. KFC Halal Trial does not use Mechanical Slaughter. 2. KFC Halal Trial uses Reverisble stunning, please confirm voltage? The animal is alive at the stunning and it is checked and ensured. 3. The slaughterhouse has Muslim Supervisors and Muslim Slaughtermen. 7. KFC Halal outlets do not mix Halal Chicken and Non Halal Chicken. I hope you are well. I am sorry for the late response as we receive an enormously high amount of emails and try our best to reply as quickly as possible, however delays can occur. 1. The HFA DOES NOT certify machine slaughter. 2. Chicken is reversibly stunned using the electric water bath method. The current would not exceed 205mA and minimum frequency will be 1000hz. The stunner is calibrated and thoroughly checked by muslim supervisor. 3. Birds will ONLY be slaughtered by a muslim slaughterman while reciting the Tasmiyah/Shahada and the entire operation will be overlooked by a muslim supervisor. 4. KFC has a comprehensive system in place where halal store will only receive halal stock approved by the HFA. Each item is traceable. 5. KFC employees go through an internal halal training program before they are signed off to work in a halal KFC store. Staff uses the appropriate documents to aid them in the delivery process. More over the supplier has controls in place to deliver the correct stock to the halal store. 6. HFA inspects each halal store on the regular basis to ensure every product (chicken and non-chicken) is coming from HFA approved sources. 7. The above-mentioned points ensure there is no mixing of halal and non-halal chickens at store and supplier level. A halal KFC store will ONLY serve halal chicken and halal non-chicken products. No non-halal product is allowed to enter the store. 8. Point answered in above-mentioned points. KFC: Unable to provide a definite answer and the suggestion is to avoid. The reason for this response is that we are unable to get the right information from HFA. They claim that every step of the process is strictly monitored. There is no contamination with Non-Dhabihah chickens and each and every chicken is tracked and monitored. The sound recommendation is to avoid until all facts of the monitoring process are made clear. My understanding is based on HFA's response to Wifaqul Ulama about HFA's methods of stun to immobilize to the slaughter of a chicken. Since HFA had not responded about the number of personnel and monitoring process for the entirety of the abattoir, Wifaqul Ulama were not able to endorse KFC (my understanding is not about KFC or Nando's, it is about the actual slaughter by HFA and the condition of a chicken in it's process of being slaughtered). That's what my understanding was/is. If I have misunderstood, then please correct me and I will update my posts to show my errors and correction. Has anyone managed do get any updates on this issue (regards German Doner). My local Imam asked me in regards to it (as many locals have asked him) and I told him I'll have a look into it. Maybe if someone knows an Ā'lim or Mufti from Germany that might help. Just a thought. In the above image: What is the word in red?